Nevada State Athletic Commission, you’re not the only governing body conducting random drug tests. On this week’s edition of “UFC Tonight,” reigning UFC light heavyweight king Jon Jones (pictured) revealed the Maryland State Athletic Commission, the committee overseeing his April 27 title defense against Glover Teixeira, popped in to his Albuquerque gym Wednesday to conduct a surprise drug exam. According to Jones, the MSAC took blood and urine samples from him. In addition, “Bones” said he was the one who requested the UFC to pursue the random drug test ahead of his showdown with Teixeira. Jones stated the UFC footed the bill. No word if Teixeira was or will be subjected to a similar exam (there’s no reason to believe he wouldn’t be), nor if more random screenings for the two are forthcoming leading into their shootout. Neither Jones nor Teixeira have ever flunked a drug test. The UFC couldn’t have picked a better day to spring a drug test on Jones. Coincidentally (or maybe not), the promotion was hosting a media day with local, national and international outlets interviewing Jones and his teammates at Greg Jackson’s famed academy today. 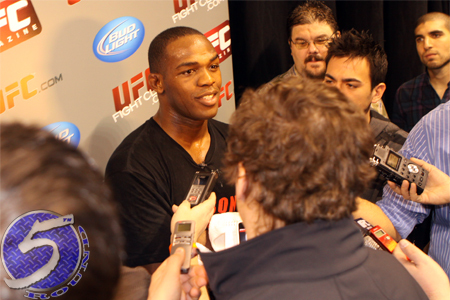 Jones defends his throne against Teixeira at UFC 172 inside Baltimore Arena in Baltimore, Maryland – assuming, of course, that both fighters pass their pop quizzes.